What’s Really Being Said? Or What Do You WISH Was? So we canceled – mercifully – our last caption contest. Just too easy. You sluts. But this shot…well, we couldn’t pass by. This coming from almost exactly a year ago, the Caps v. the Leafs at Verizon. 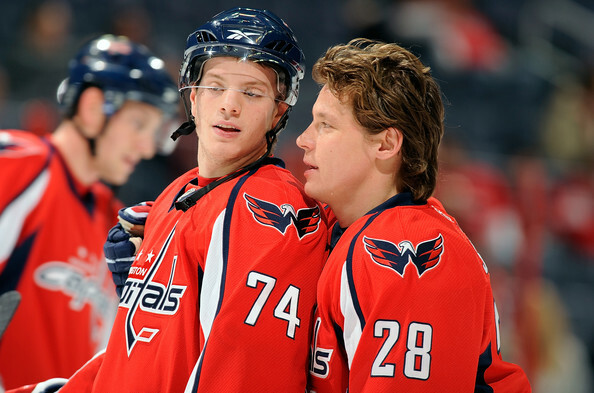 John Carlson and Sasha Semin seem to be sharing more than just Bruce Boudreau’s latest tips. We just have to wonder what exactly is being exchanged here. Or…what might be. Leave your thoughts below…and be ashamed of yourself. This entry was posted in Uncategorized, Washington Capitals and tagged Alexander Semin, John Carlson, sweet whispers. Bookmark the permalink.